2018 New Album "We Transfer"
Markus Burger (born September 30, 1966) is a German pianist, composer and music educator. He works in a variety of genres, including jazz, new-age, chamber and film. His music has been performed in Europe, the former Soviet Union, Africa, and most recently in the United States. He began studying piano at age six and later earned his Diplom in Performing Arts from the Essen Folkwang Hochschule in Germany, a B.A. in piano and Composition from the University of Maastricht in the Netherlands and a Certification in Popular Music from the University of Hamburg, Germany. He studied with Peter Walter, John Taylor, Kenny Wheeler and Kenny Werner. He has released 11 albums, featuring his own compositions and arrangements, among them, his most recent release, The L.A. Sessions with his newly formed jazz collaborative, Accidental Tourists. The L.A. Sessions, released by Challenge Records in 2012 (2013 worldwide), is the first of what Burger hopes will be a series of albums, and sees him launching his collaborative by teaming up with jazz veterans, drummer Joe LaBarbera (Bill Evans, Art Pepper and Tony Bennett) and bassist Bob Magnusson (Art Pepper, Bill Evans). 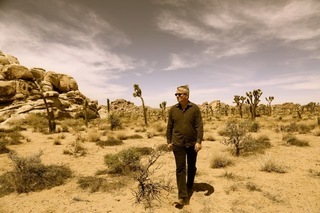 After months of composing and arranging, sifting through his favorite standards, and figuring out where and with whom to record first, Burger found himself serendipitously (and accidentally) launching his musical trek in his own "backyard" of Los Angeles, collaborating with the former rhythm section of his idol and early jazz influencer, piano legend Bill Evans. In addition to Accidental Tourists, Burger has been playing to sold-out audiences around the world with his Spiritual Standards duo project, with Berlin-based saxophonist Jan Von Klewitz. 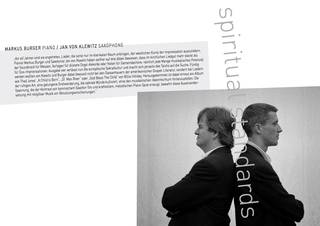 Spiritual Standards, the project, is a collection of contemporary jazz improvisations of Johann Sebastian Bach's greatest chorals and masterpieces, which at one point, made it into the Top 20 in the German Jazz charts in 1999. The duo were also the winners of the coveted 2000 Bach Award of the city of Erfurt, Germany. His second album, The Smile of the Honeycake Horse, with his quartet Septer Bourbon, received rave reviews from the European press and Down Beat magazine in the United States, and achieved something of a "cult following" in Germany. In developing his signature sound over the years, Burger drew his influences from a wide range of musical styles including J.S. Bach, Claude Debussy, Keith Jarrett, Thelonious Monk, Miles Davis, Pat Metheny, Elton John, Stevie Wonder and E.S.T. Spiritual Standards official video of "The life of a peaceful soul"